Wow. Talk about great composition and colors in a photo — this one has it all. It was taken in Prague in January of 2008. The most striking thing about the image is the depth of field — everything is in focus, allowing the viewer to see the details on the buildings. Good work, Vratislav! Dear Vrat’a, I like this picture – it’s wonderful. The dark blue sky and the golden yellow of the facades harmonize perfectly! 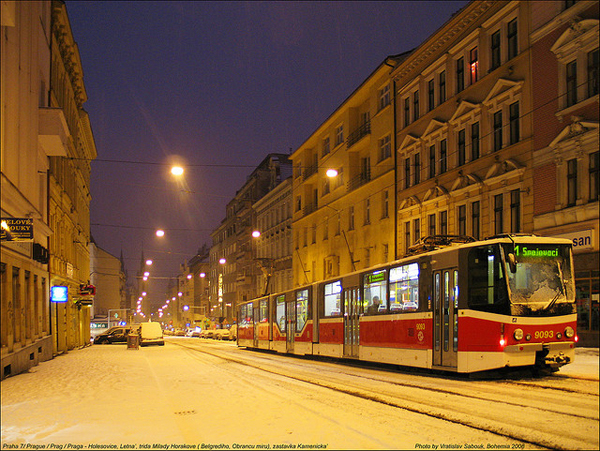 I was in Prague last fall and learned that the city stayed with the old tracks and overhead electricity connection due to the amount of bad weather – snow etc and the fact that the overhead electrical cars could get through when other busses could not. The photo is wonderful! Well done, Vrato! Great photo! Congratulations! I know this part of Prague very well, I admire You, Vratislav, for Your sense of nice Prague corners. Vratislav´s photos -it is worth an exhibition right in the Prague, I think!